Matt Pelfrey is a film, theatre and television writer. He worked as a staff writer on the MTV drama SKINS and wrote, produced, and directed webisodes and content for the SKINS/MTV website. 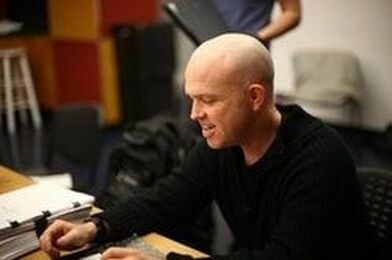 His screenplay SURVIVALISM was included on the 2011 Blood List, an industry-generated list of the favorite unproduced horror and thriller scripts in Hollywood. He is a Co-Artistic Director of Furious Theatre Company. His plays have been produced around the country and overseas to critical acclaim and include COCKROACH NATION, TERMINUS AMERICANA, AN IMPENDING RUPTURE OF THE BELLY, PURE SHOCK VALUE, FREAK STORM and the stage adaption of IN THE HEAT OF THE NIGHT, THE PILO FAMILY CIRCUS, WINKIE and THE BASKETBALL DIARIES. His plays are available from Original Works Publishing, Broadway Play Publishing, and Samuel French. He is the winner of the Actor’s Theater of Louisville’s Heidman Award, a Backstage Garland Award for playwriting and was nominated for an LA WEEKLY playwriting award and a Los Angeles Ovation award. He received his BA in Creative Writing from San Francisco State and his Master in Fine Arts in Playwriting from U.C.L.A. He is the Program Director for the MFA in Writing for Screen & Stage at Point Park University, Pittsburgh.